Snapshot Saturday carries on except for the fact that Alyce at At Home With Books will be taking a hiatus. During that time, Melinda at West Metro Mommy has kindly stepped in to be our fearless leader. Thanks so much to Melinda for doing this. I’d be lost without Snapshot Saturday!! As I mentioned last Saturday, I’m not much of a gardener, but I have inherited some beautiful flowers that just do their own thing. I’ve shared my crocuses, my lilacs and last week my irises. Thanks to everyone who left such kind comments about them. This week I’m sharing a flower, some say weed, that made a guest appearance in last week’s iris photos. The bluebell. I know there is a technical name for it, but Gram always called them bluebells and half the time she like them, half the time she was waging a battle against them. They would never grow where she wanted them to grow! As a result, they’re pretty much all over the place. They’re usually that pretty deep purple-y blue which everyone recognizes. As I walked out of my back door earlier this week I noticed a phenomenon. A whitish blue version of the sometimes beloved, sometimes dreaded bluebell. I’ve never seen one like this before and I was stunned. So glad I had my camera with me at the time so that I could catch it. This would have been worth going back in the house for my camera if I hadn’t had it. I love it! Don’t forget to stop over at West Metro Mommy to check out the other great photos that everyone will be sharing for Snapshot Saturday. Thanks, Louise! Have a great weekend! You don’t see snap dragons much anymore, but I can just picture Little Cathy doing that! Have a great weekend!! So delicate and lovely Fran. Thanks, Diane, so glad you liked them! It is gorgeous in white!!! Those are so pretty! I love how the purple is such a gentle color in the middle of the white flower! Glad you like them, Melissa. I thought they were so unique. Have a great weekend! Great shots! I love these flowers, even if they grow all over the place. Although I didn’t know that fun fact about them, not being a gardener…lol. Thanks for sharing…and for visiting my blog. Have a great weekend! Glad you like them, Laurel! Have a great weekend! Beautiful flowers. I could look at flowers all day long. We went to the botanical gardens in Amsterdam, and they were beautiful. Botanical gardens are wonderful to visit and I’ll bet in Amsterdam they were incredible! Have a wonderful weekend, my dear! So pretty! 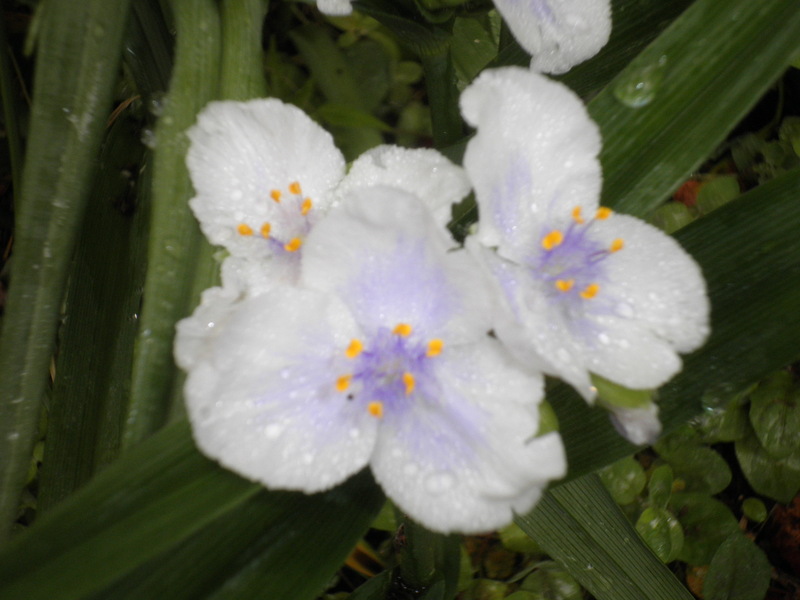 They are called Tradescantia – the botanical name. 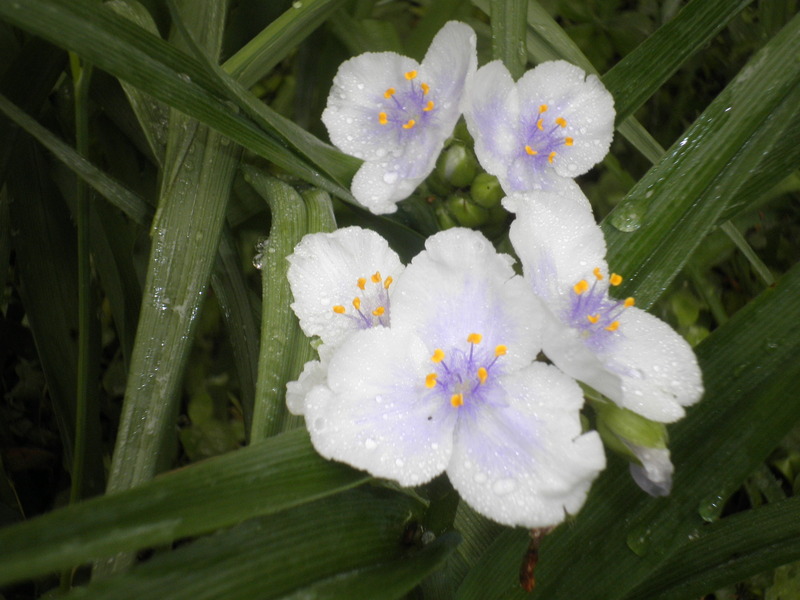 Spiderwort is the common name with ‘pet names’ for the different colors. Yours are so lovely! Susan, thank you SO much for clarifying that for me. I just wrote it down so I won’t forget. I’ve had the blueish purple ones for years by never saw this white/pale blue one before. I was so impressed! Have a great weekend! You have some delightful flowers there, Fran. I hope you have all that you want! Thanks, Rob. They’re here because my grandparents planted flowers that wanted to live forever! I’m very lucky to have them. Have a great day! I call them Spiderwort too. I have purple ones in my wildflower garden. I don’t consider them a weed, just a more independent type plant. I never heard them called Spiderwort, so I’m glad to know their real name. Gram always called them bluebells, but I never thought the really were…although you didn’t argue with Gram! I like that…not a weed…a more independent type plant. Excellent! Those are lovely flowers! Thanks for taking part in Saturday Snapshot. Thanks, Melinda and thanks for visiting! Well, weed or no weed, Bluebell sure is pretty! Thanks, Joy, I think so too! Thanks for visiting! Trust me, Ameena…if these were flowers that I inherited, they probably wouldn’t be here! Have a great day!! Thanks, Jessie! Love taking flower photos. Have a great day!